Runnings is a regional retailer specializing in agricultural, automotive, and hardware products. Runnings’ history in Bismarck spans back to the 9-store regional Sandvig chain, which was founded in 1970. Sandvig maintained a location in each Bismarck and Mandan when it was acquired by Country General in 1985 and formally integrated in 1987. The former Sandvig stores continued to operate under their original name until 1996. Runnings arrived in Bismarck-Mandan upon its 2001 purchase of Country General and its parent, Quality Stores Inc. of Michigan, who was forced into bankruptcy. 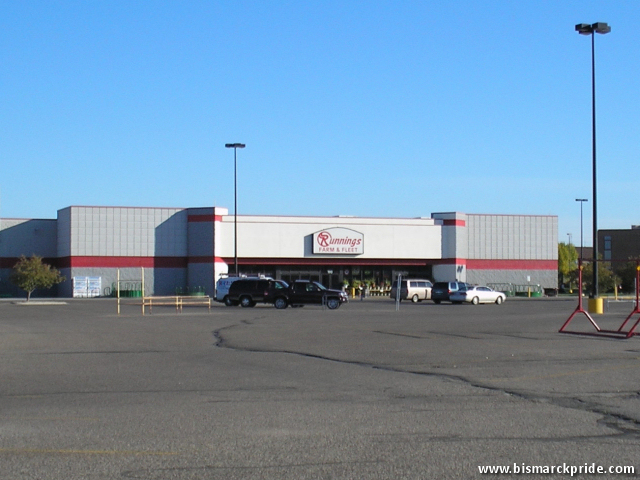 The original Bismarck Sandvig was located at 1120 East Main avenue before relocating, in 1977, to 3131 E Broadway Ave, where it remained until again relocating, this time into the former Wal-Mart store at 701 S Washington Street in 2006. The Mandan store has been located on the strip since opening. Runnings was founded in 1947 and is based in Marshall, Minnesota. As of 2017, the company maintained 41 locations in 6 states.